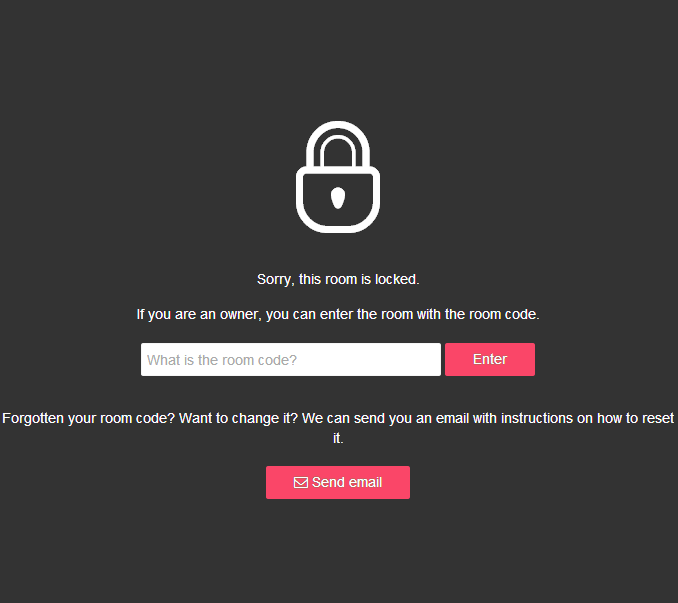 Get notified when someone enters your room! We have now made it even easier to start a video conversation. 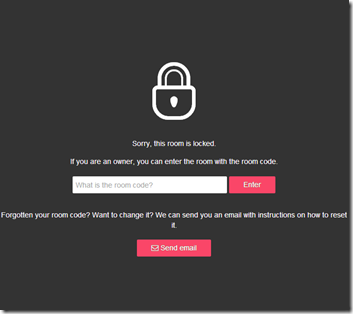 When someone enters your appear.in room, you will receive a desktop notification that you can click to enter the room. How can you use notifications? 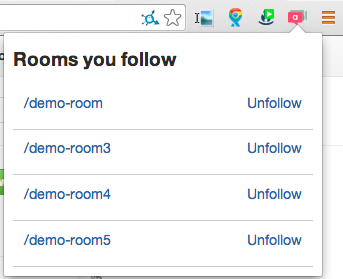 Notifications work using a Chrome extension, but once you have this installed to can monitor multiple rooms. So if you were wanting to run remote tutor support hours you could claim an appear.in room and enable notifications. Once you advertise your office ours you can monitor the room, get on with other work and wait for notification. Because appear.in allows you to ‘lock rooms’ if you are providing one to one support you can prevent someone else ‘walking in’. The awkward bit is handling the locked room. There is no queuing service and anyone visiting a locked room will be presented with the message below. Unfortunately if someone visits a locked room, sees the locked message when the message doesn’t go away when the room is unlocked. A way around this might be to have two rooms – corridor and office. The corridor room would always be open. As people arrive in the corridor room you could greet them and invite them to your ‘office’ and lock the office during consultation. Once done you could go back to the ‘corridor’ room if anyone else is waiting. If the ‘corridor’ gets busy (more than 7) you’ll have to sit in it yourself or lose the ability to enter (unless as an owner you get priority). I love appear.in for same reason as you. Love the idea of corridor to office. For me office hours would be with appointment times for each person and or a learning group together so not much of an issue. But if I wanted to be around and get on with me work you corridor idea seems easy enough to me not faffy. It is such an easy to use app, and it fails less than Skype does for me. Dag-Inge from appear.in here! I just stumbled upon this post yesterday, and I thought your use case was very cool. I’m actually working on a feature right now that might make this a bit more user friendly, and I was wondering if you could let me know if that could help solve this use case a bit better. So, the idea is that we want to have a knock-feature for locked rooms. The owner would lock the room, and visitors that wanted to join in on the conversation could knock, either by taking a photo of themselves or writing a small message (usually their name) to the owner to identify themselves. The owner could then decide if they want to let them in, or reject them. Could this maybe solve your use case? Do you see any problems with it? Hi – I love the idea of a knock feature with picture. I think this would be useful in other cases where someone is arriving late or for only part of the meeting. The main thing is that currently the lock screen doesn’t refresh when the room is unlocked. If the knock feature handled this with a more informative message and action it would be perfect. In terms of functionality it would be nice when someone knocked that the room owner could see these in order of knock. It would also be nice if there was a setting which would also prevent anyone knocking. So it sounds like you are working up your platform into a paid for service? If so do you know at this stage if there will be a freemium model? Das-inge, first things first: I love appear.in and wish others would be willing to let go of Skype and try it. I have encountered a lot of resistance to try it even though I say: Read my lips, there is nothing to set up! Yes, to all that Martin suggests it would help my case too, particularly the option to allow knocking or do not disturb. Wonder about a setting that would tell ‘knocker’ when to come back? In my case, I do tend to know how long the meetings will last so I could enter a time before I lock the room. Look forward to improvements – it is pretty cool already! More echoes of yes and thumbs up and plus ones here, Das-inge. I am planning to use appear.in starting next week for my online class, and its perfect for a course where I am tying to minimize the number of accounts people have to make. The knock/doorbell would be definitely a useful addition. Or what about a setting where I could customize the message on the lock screen? That way I could state what hours I plan to be there. Thanks for building such a useful, free tool for us teachers.